Lapis Lazuli Candypop Buds are blue Candypop Buds found in all Pikmin games. They behave the same way as all other Candypop Buds, except they change non-blue Pikmin into Blue Pikmin. Their name is derived from a semi-precious dark blue mineral called lapis lazuli. 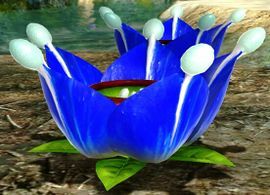 The buds are usually found in close proximity to water, and finding them can generally be taken as an indication that Blue Pikmin will be needed. Any Blue Pikmin thrown in will revert to leaf Pikmin while retaining their original type. Pikmin features a 50 Pikmin limit per Candypop Bud where Pikmin of the same type as the bud count towards the limit. This feature was changed in subsequent Pikmin titles which feature a five Pikmin limit per bud and where Pikmin of the same type as the bud do not count towards the limit. Interestingly, the Lapis Lazuli Candypop Buds found in the Twilight River Remix can each produce 10 Pikmin, instead of 5. The Distant Spring: One on the beach with the Massage Machine, another on the beach near the Chronos Reactor. The Final Trial: One near the landing site. Frontier Cavern: One on sublevel 5 (Bulbmin available). Snagret Hole: Three on sublevel 6. Hole of Heroes: Two on sublevel 6. Tropical Wilds: Four near the Calcified Crushblat arena. Formidable Oak: One in the water under the clipboard, and one at the end of the cave. Beastly Caverns: Two inside a cave, near the entrance. Twilight River Remix: Two on the north side, across the river. Beastly Caverns: Two outside the cave, in the center. The Lapis Lazuli Candypop Bud entry in the enemy reel. artwork of the Lapis Lazuli Candypop Bud. Clay art of the flower. The flower in the Piklopedia. Lapis Lazuli Candypop Bud cards pack. This page was last edited on March 9, 2019, at 16:26.